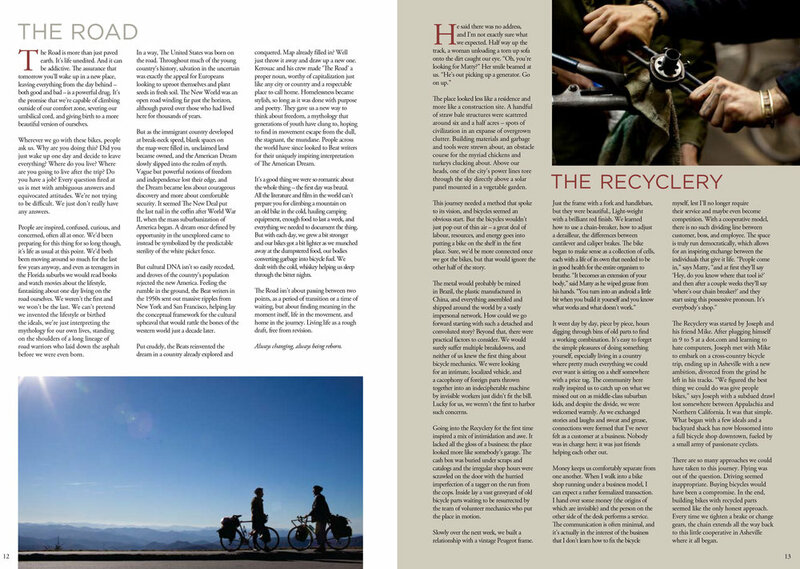 We are brothers Tim and Noah Hussin, and America Recycled is a film following our two year bicycle journey across the American South. In addition to documenting our own experience on the road, we live with and film modern homesteading communities that creatively challenge conventional wisdom regarding production, consumption, land development, and community. At once poignantly elegiac and inspirationally optimistic, America Recycled is a likeably idiosyncratic off-grid road-movie from first-time film-makers Noah and Tim Hussin. A thought-provoking, conscience-pricking picaresque shot during the bicycling brothers' two-year journey from North Carolina to California, it won the prize for best American feature-length documentary when world-premiering at the 'AmDocs' festival at Palm Springs in March. Further non-fiction festival play is surely on the horizon for this Stateside cousin of Marcel Barrena's popular Catalan globetrotter Little World (2012). Younger audiences are likely to embrace such a palpably honest enterprise whose DIY ethos and accessible brand of idealistic, earnest eco-consciousness make it ideal for non-traditional exhibition spaces: film-festivals, community-groups, grass-roots collectives, etc. The Hussins are repeatedly drawn to such unorthodox experiments in communal living all along their epic 5,000-mile route, as they investigate lo-fi, low-impact alternatives to the consumerist, chainstore-dominated nightmare that at some unspecified point subsumed the utopian American dream. They seem to have remarkable luck in stumbling across colorful, offbeat, garrulous characters, such as thoise found in a "gayborhood in the backwoods of Tennessee". "Small community living has been lost in America" remarks roadkill-chef 'Cory' early on, chiming with Noah's diaristic-essayistic voiceover which is a recurrent element of the soundtrack — along with twangly folky guitar and banjo tunes, the brothers never seeming to stray far from a stringed acoustic instrument and/or a campfire. "The silence is deafening," Noah remarks at one point in Texas — but the score, while always in keeping with the general mood, is as much distraction and intrusion as an embellishment. The self-sufficient Hussins, keen to escape their middle-class comforts ("we had been spoiled by a life of abundance") are squarely and self-consciously treading in the boot-prints of myriad illustrious predecessors here, from Thoreau and Emerson to Jack Kerouac, Woody Guthrie, Ken Kesey and Edward Abbey. And there are times when Noah's narration strives a little too hard for profundity and homily. But if the tone is occasionally a touch sophomoric, this is very much a film made with the confidence and indomitable, persuasive energy of expansively articulate and sensitive youth. Not to mention a helpful strain of wry, self-aware humor. While there may be nothing particularly groundbreaking or surprising about the assertions made ("this land was an open question... a chance to live life as a rough draft, always being reborn") or about the conclusions drawn, such an reminder of easily-overlooked verities is both welcome and urgently topical. The sheer range of places and people encountered — on a journey notable for its lack of mishap and friction — is enough to make the journey emphatically worthwhile. No wheels are reinvented here, but the spokes and treads navigate some intriguing byways indeed. It certainly helps that America Recycled, while evidently assembled on minimal means (some $3,290 was raised via KickStarter), is so alluringly easy on the eye. Credits proclaim simply that it is by 'the Hussin brothers', but it seems safe to presume that Tim Hussin, a photographer by trade, is chiefly responsible for its unfussily alluring visual scheme. Cramming what must have been acres of footage into a compact running-time using generally brief shots and scenes, hand-held immediacy is productively punctuated with some striking tripod-mounted fixed shots. Showcasing the brothers' fluent knack for on-the-hoof composition, the colors and light of the eclectic environments — exteriors and interior alike — crisply convey pungent senses of place.